Worldwide, the digital data we create doubles each year; with experts predicting we will produce a huge 44 zettabytes of data every year by 2020. Storing and accessing such vast amounts of data is costly, energy intensive and time-consuming. Cloud storage has revolutionized the way we store and share documents, pictures, and data. The traditional cloud storage operators, such as Microsoft Azure, take our uploaded data and store it in centralized servers. 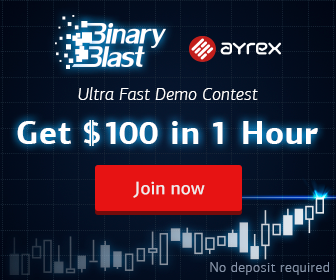 However, traditional cloud storage has encountered several problems with the security of users data due to these centralized servers, which experts argue, offer a single point of attack for hackers. Likewise, legacy cloud storage providers don’t encrypt data by default, and if they do, it’s most often on the server-side, rather than the client, leaving data vulnerable and exposed during ‘transit’. Alongside this, there have been issues with availability and performance for those who are far away from the cloud’s data centers. With the emergence of blockchain technology, it has enabled decentralized cloud storage which could provide a much-needed solution to the growing worldwide data needs. 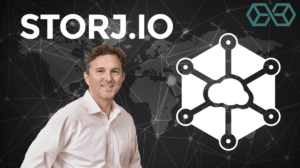 Blokt interviewed John Quinn, Co-founder and Chief Revenue Officer of Storj, to find out why decentralization is ushering in a new era in cloud computing. Storj Labs is a decentralized cloud storage solution provider based in Atlanta, USA. Founded in 2014 by Shawn Wilkinson and John Quinn, Storj uses blockchain technology to provide data storage which offers greater privacy, security and reliability than legacy, centralized cloud storage. 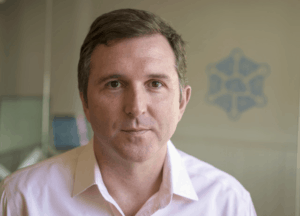 John Quinn, who previously held roles at the financial institutions Credit Suisse and Deutsche Bank, brought strong leadership to Storj, helping it to complete a $3 million equity round in 2016, and Storj’s $30 million token sale in 2017. The Storj concept formed when Shawn Wilkinson, after searching for an affordable place to store large data sets, found that centralized cloud storage was expensive, restrictive and left data exposed. Instead, Shawn envisaged a platform where he could store data in friends’ storage devices using blockchain, forming the key principles behind Storj. As the majority of storage devices are operating at less than 25% of their total capacity, the Storj network consists of storage node operators who have excess storage capacity and those who need to store data in the cloud. These two network participants form the core of the Storj network, the node operators acting as the ‘suppliers’ of storage space, and your traditional user who requires secure cloud storage as the demand. Storj’s V3 Network, which launches in fall 2019, is an S3-compatible storage solution, which means that new users can implement the Storj platform into their existing storage architectures using just a few lines of code. Compared to it’s predecessor, the Storj V2 Network, the V3 network will build solutions to scalability issues encountered when the V2 network, running since 2017, hit a staggering 150 petabytes of data. Likewise, Storj will facilitate connectors, parties who transfer data among components, right from the launch. This allows Storj’s open source partners to generate revenue every time the users of their platform stores data on the Storj network, through the Storj open source partner program. The Storj Open Source Partner Program enables the open source software (OSS) community to passively earn revenue every time their users store data in the cloud and allows participation in the shared value creation of Storj’s partnership program. As expected, Storj’s program has generated a lot of interest from OSS companies. To date, Storj has established partnerships with ten OSS companies including MongoDB, MariaDB, Couchbase, Minio, and others who are keen to use the Storj monetization model. It’s little wonder that Storj is forming strong partnerships because currently there is a huge gap between cloud computing revenues and the remuneration for OSS companies. Quinn added that since it is very expensive and time-consuming to become a traditional infrastructure provider, and requires massive scale to become a cloud infrastructure provider, it is almost impossible for OSS projects to tap into the largest computing trends. 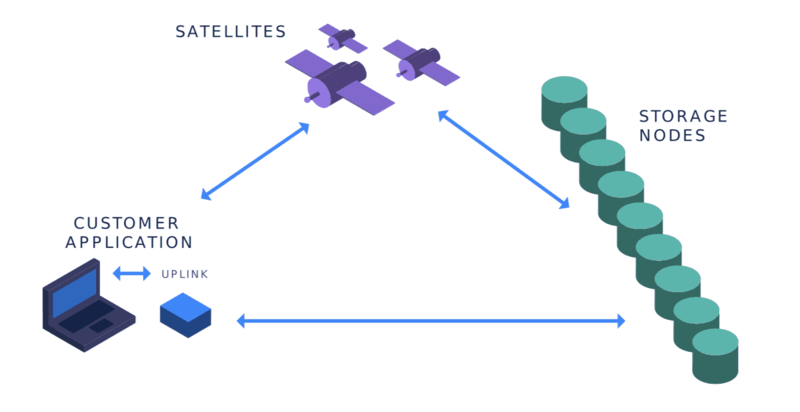 The Storj Network consists of three distinct parts, storage nodes, the uplink, and satellites for communication. The Storj network consists of three parts. The first is storage nodes, which store data and are operated by individuals who wish to rent out excess hard drive capacity and bandwidth. Secondly, there is the Uplink, which uploads data to the network, connecting applications to facilitate data storage on the platform. The final part of the network is the Satellite, which coordinates the traffic between Uplinks and storage nodes. Currently, Storj is encouraging individuals to become V3 storage node operators. We asked what V3 nodes were, and what benefits do node operators get? At the current stage, much of the data on the Storj network is test data, which has assisted in the fine-tuning of the Storj network ahead of the full network launch. Quinn adds that during the next phase of the alpha, which is the Vanguard release, developers and partners can begin storing data on the Storj network in a test capacity, ahead of full production launch. One of the most interesting features of the Storj network is that V3 storage node operators only require consumer-grade computer hardware, and a constant connection to the internet, alongside the extra hard drive capacity and bandwidth which they’re willing to share. The STORJ utility token facilitates payments to the Storj network of storage node operators. Without a native token, Quinn says, it would be impossible to reward all node operators within the network. As the amount of node operators is expected to grow, the Storj team have been evaluating the Raiden network, to make payments more affordable, in less time, and programmatically. STORJ is currently trading on many high volume exchanges including Binance, Bittrex, OKEx, and HitBTC. The main upcoming releases on the Storj network include Vanguard, which is a few weeks away from launch and will see developers beginning to store data on the Storj network. Later in the year, the Storj Pioneer release will mark the launch of the Storj beta, after which the Storj network will move towards full production. In comparison to other S3-compatible object storage solutions, such as Amazon S3, Google Cloud, and Microsoft Azure, Storj’s decentralized nature gives it a competitive edge over traditional providers. Storj Labs have made strides in delivering one of the fairest and transparent cloud computing networks ever developed, and providing economic empowerment for the open source community. Blokt looks forward to seeing the beta release of the Storj platform in fall 2019. Storj to Disrupt Amazon, Google and Microsoft, Says Co-founder John Quinn was originally found on copy trading cryptocurrency | Blockchain News | Bitcoin News | blokt.com.